10 day SMA of Trin Near 1. Avoid shorting until Nifty Dips below 4509. If Dips below 4509 then trend will be rangebound between 4509-4253 Also have a close eye on trin. 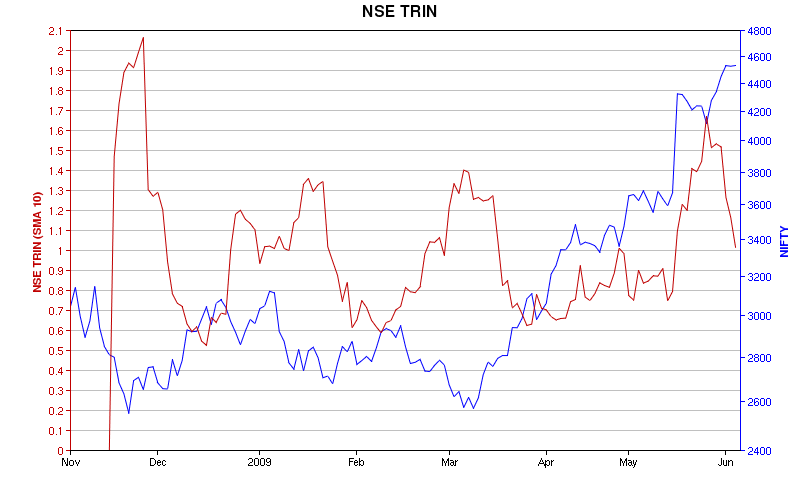 Trin Dipping below 1 now provides buying oppurtunity in the market. Negative Factors: 1)Lower PCR(0.82) suggests overconfident markets… but not a bullish nature 2)Weekly RSI-2 of USD Index trading below heavily oversold levels. Possibly this could invoke FII selling in short term 3)TRIN Still abpve 1 4)Negative Divergence in Hourly charts 5)Weekly Supports near 4250 levels…far away from the spot Rest Everything looks bullish!!! !